Central & West Africa is comprised of the same rock type and similar geological formation as the Carajas System in South America. 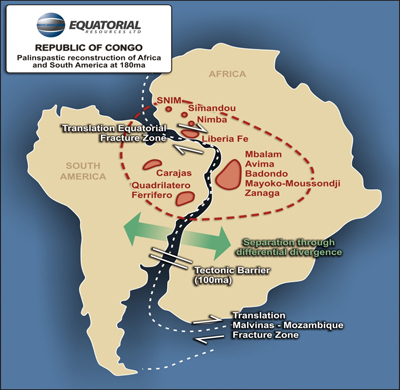 The nearby image depicts a view of Africa and South America when the two continents were joined as one land mass and indicates similar iron deposits on either side of the fracture zone. 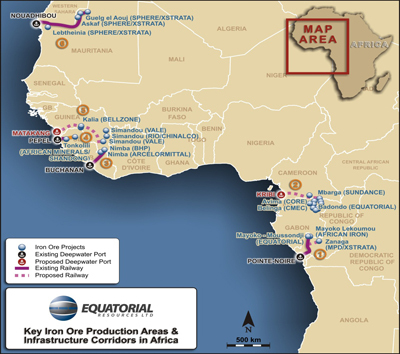 The expected pipeline of iron ore production announced by exploration and development companies in the region indicates that Central & West Africa has the potential to supply a significant percentage of the global seaborne supply of iron ore by 2020.